Blast furnace (BF) process of iron making is a process where liquid iron (hot metal) and liquid slag are produced by the reduction of iron bearing materials (sinter and/or pellet and lump ore) with coke and by fluxing of the gangue material of the feed materials. The process is the result of a series of chemical reactions which takes place in the blast furnace. The separation of slag from the hot metal takes place in liquid state. Slag has a lower melting point and is lighter than hot metal. In the blast furnace it is at a higher temperature than the hot metal. Blast furnace slag contain predominantly silica (SiO2), alumina (Al2O3), lime (CaO) and magnesia (MgO) along with smaller amounts of FeO, MnO, TiO2, Na2O, K2O and S. Blast furnace (BF) slag composition has very important bearing on its physicochemical characteristics which influences to a great degree the smooth operation of the blast furnace, slag handling, coke consumption, blast furnace productivity and the quality of the hot metal. Low alumina slag normally has low viscosity, high sulphide capacity and low liquidus temperature as compared to high alumina slag. Blast furnace slag alumina (Al2O3) is mainly dependent on the alumina content of the input materials mainly iron ore. In those cases where iron ore alumina is less than 1 % the alumina content in the slag hardly goes above 10 %. But in some iron ores (normally found in India) alumina content is 2 % and higher. Such ores raise the alumina levels in blast furnace slag to 20 % and higher. To operate a blast furnace with such high alumina slag is quite difficult and need a different type of skill from the blast furnace operators since with the increase in the Al2O3 content of the slag, the blast furnace operation has problems such as excess accumulation of molten slag in the blast furnace hearth and increase in the pressure drop at the lower part of the furnace. Hence it is important to keep good slag fluidity in the blast furnace operation for keeping good permeability and good drainage of slag during tapping. There are four kind of slags with distinct compositions are produced at different regions inside the blast furnace due to a series of reduction reactions. These four types of slags, namely primary slag, bosh slag, tuyere slag and final slag, are generated respectively in the cohesive zone, dripping zone, raceway and hearth. The slag fluidity in a blast furnace affects softening melting behavior in the cohesive zone, permeability in the lower part of the furnace due to the liquid hold up in the dripping zone, liquid flow in the furnace hearth and the ability of the drainage of the slag through the tap hole. Good tapping is dependent mainly on the final slag which should have low liquidus temperature, low viscosity and wide fluidity. The slag fluidity is affected by temperature and composition of the slag. High alumina in BF slag has many adverse effects. The characteristics of slag having high alumina are as follows. The viscosity of molten slag is dependent basically on its chemical composition and on its temperature. Slag viscosity is an important process variable of the blast furnace process. It is the transport property of the slag that relates to the reaction kinetics and the degree of reduction of the final slag. Low viscosity helps to govern the reaction rates by its effect on the transport of ions in the liquid slag to and from the slag/metal interface. It also determines the slag metal separation efficiency, the metal yield and impurity removal capacity. It also ensures a smooth running of the furnace. High alumina slag has got high viscosity for constant basicity (CaO/SiO2). However with an increase of basic oxides and that of temperature above the liquidus temperature of slag, the viscosity of high alumina slag decreases to some extent. In BF operation, the slag drainage phenomenon in the furnace hearth is a fluidization phenomenon dominated by viscosity. The slag drainage rate decreases as the slag viscosity increases. Higher alumina slag has greater tendency towards silicon reduction and there is tendency towards increase of hot metal silicon level. This can be either due to rise in the equilibrium concentration of silicon or not attaining the equilibrium levels at all. The sulphur content of the hot metal tends to increase with the increase in the alumina content of the slag. Hence the high alumina slag contributes to less efficient desulphurization. It is observed that not only is the equilibrium distribution of sulphur between metal and slag is affected adversely but the rate of attaining such a distribution is also markedly slower. Hence there is slower pick up of sulphur by the high alumina slag since the sulphur equilibrium is not being attained within the blast furnace,. The pressure drop in the dripping zone increases as the Al2O3 concentration in the slag increases. Even if the ratio CaO/SiO2 increases the pressure drop in the dripping zone increases. The pressure drop is mainly caused by the effect of wettability as a result of the slag static hold up, little due to the effects of dripping slag viscosity and crystalline temperature. The permeable resistance in the cohesive zone increases as the Al2O3 content of the slag increases. The increase of permeable resistance in the cohesive zone can be suppressed by increase of MgO in the burden. Physical effects of increased MgO content in the slag are just the opposite to those of alumina. MgO helps in the maintenance of good slag drainage from the hearth during tapping. As the level of MgO increases in the high alumina slag, the sulphur content of hot metal improves for a given range of silicon. This is probably due to the higher fluidity of the high MgO slag. High MgO slag is advantageous for the control of both sulphur and silicon. Decrease of slag basicity is also helpful. To offset the deteriorating effect of high alumina slag operation of the blast furnace, the following measures are important. Since increase in slag MgO improves the hearth drainage rate at high alumina slag operation, MgO in the slag is to be kept at a level which is more than the minimum level. The correlation between Al2O3 and MgO is given in Fig 1. Higher MgO level in the slag also improves the permeability in the cohesive zone of the blast furnace. 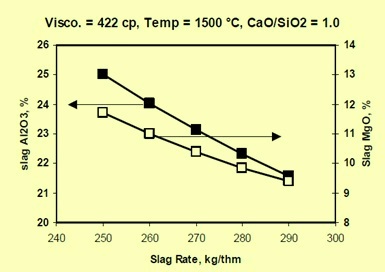 To suppress the increase in the pressure drop in the dripping zone, it is important to decrease the slag hold up by the decrease of CaO2/SiO2. Permeability of the dripping zone is improved by decreasing the slag CaO/SiO2 ratio in the slag to around 1 %. One other method for reducing the effect of high alumina in slag is to dilute the level of alumina in the slag to lower concentrations by addition of extra slag forming materials in the blast furnace burden. However this would result into higher slag volume and would involve higher flux and coke rates and lower productivity of the blast furnace. This method can be used for control only as an occasional remedy. what if slag basicity is above 1?